Nicholas Ridley had one of the finest minds in England, and after attending Cambridge and the Sorbonne in Paris, settled down to a scholarly career at Cambridge. 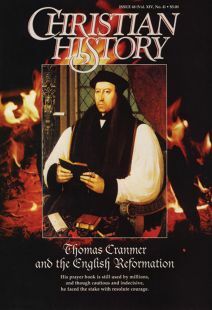 About 1534, he began showing interest in Protestantism, and in 1537, he became chaplain to Archbishop Thomas Cranmer. He influenced Cranmer’s thinking, moving Cranmer from the Catholic doctrine of transubstantiation. In the 1540s, when a Roman Catholic reaction set in during Henry’s reign, he was suspected of heresy, but during the reign of Edward VI, he became bishop of Rochester, and eventually bishop of London, as well. As bishop of London, Ridley had stone altars replaced by wooden tables for observing Communion, which caused an uproar in the city. He also instituted pastoral work in the city, aiding the poor and founding hospitals and schools. Just before King Edward died, Ridley unwisely supported the claim of Lady Jane Grey to the throne. When Mary became queen, Ridley was imprisoned in the Tower of London. He was joined by Hugh Latimer and Thomas Cranmer, and all three were taken to Oxford, where their “heretical” opinions were examined. When given an opportunity to recant his views, Ridley declined, and he was condemned to be burned. Hugh Latimer started out as a passionate Catholic, and his conversion to Protestantism was extraordinary. During his years at Cambridge University (he enrolled in 1506), he gained a reputation both as an ascetic and extraordinary preacher. Upon receiving a degree in theology in 1524, he delivered a lecture in which he assailed German Lutheran Philip Melanchthon for his high view of Scripture. Among Latimer’s listeners was Thomas Bilney, a leader of a society of Protestants at Cambridge. After the lecture, Bilney asked Latimer to hear his confession. The startled Latimer, believing his lecture had converted the evangelical, readily complied. The “confession,” however, was a stealthily worded sermon on the comfort and confidence the Scriptures can bring. Latimer was moved to tears—and to Protestantism. Latimer’s sermons now targeted Catholicism and social injustice. He preached boldly, daring in 1530 to utter a sermon before Henry VIII that denounced violence as a means of protecting God’s Word. For this he won the king’s respect. This farmer’s son soon became one of Henry’s chief advisers after the king’s break with Rome in 1534. Appointed bishop of Worcester, he supported Henry’s dissolution of the monasteries. When he opposed the king’s Six Articles, though, he was put under house arrest for six years. Under Edward VI, Latimer flourished as a leading preacher of Protestantism. But with the ascension of Mary, he was again imprisoned. His refusal to compromise his convictions only earned him the stake. He was executed next to Nicholas Ridley.